London : Swedish researchers have found that laser light can be used to examine the lungs of premature babies without exposing them to X-ray radiation, which can prove to be much harmful. 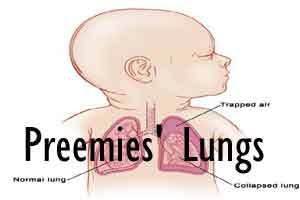 Premature babies, born before 30 weeks of pregnancy, often need help breathing in order to survive. X-ray is currently used to diagnose the condition of the lungs, but the technology involves risks and X-ray images can only be taken occasionally. “Multiple X-ray examinations involve a certain increase in the risk of developing cancer, not least in small children. Decreasing the number of X-ray examinations would be a major advantage,” said Emilie Krite Svanberg, anaesthesiologist and researcher at Lund University in Sweden in an official statement. The laser beam is a safe method of analysis and is weak and harmless to the child. The spatial distribution of air, that is how much oxygen is present in the different part of the lungs, can also be detected. The method will provide doctors with more information compared to X-rays and will enable continuous monitoring of the baby’s condition, facilitating faster implementation of appropriate measures, the researchers explained. The study suggests that the laser light could be used to measure oxygen function in the lungs by sending light of a certain wavelength into the body, and then measuring how much of the light can be retrieved. The submitted light must be at exactly the right wavelength light beam must be precisely 760.445 nanometre. Based on this, the oxygen supply that exists in cavities such as lungs, which is much more difficult to measure can be calculated. These measurements could help determine whether or not a premature baby needs treatment in order to improve their breathing. If intensive interventions are necessary, such as inflating collapsed parts of the lungs, light measurements could also be used to minimise the risk of injury from the treatment. baby’s chest. This would enable measuring the lung function continuously, in a way that is completely safe and that doesn’t bother the child,” Svanberg maintained. Presently, it is difficult to constantly maintain the proper settings on a respirator as premature babies’ condition can changes over time. The lungs have to be inflated to provide sufficient oxygenation but without damaging the lung tissue, which can happen with too much pressure. The method has already been successfully tested on 29 children at Skåne University Hospital in Lund, Sweden.